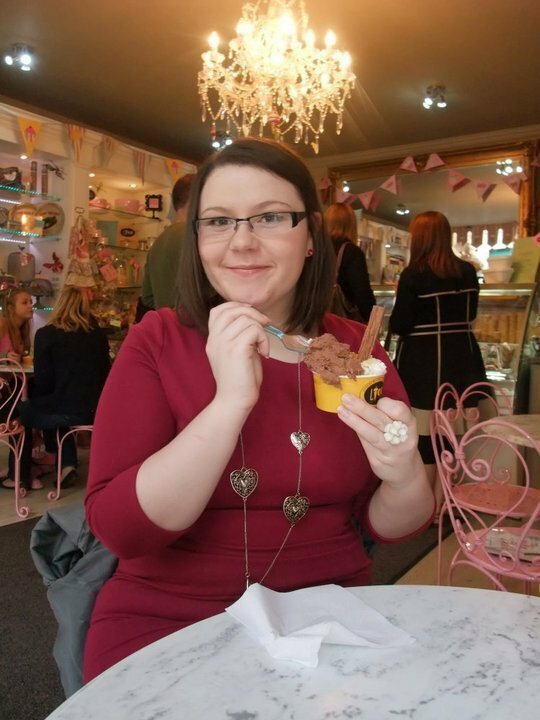 The Homemaker Chronicles | 'Let them eat cake!' she said. You don't have to tell me twice. 'Let them eat cake!' she said. You don't have to tell me twice. I’ve just come back from a 4 day trip to Paris and I want to show you some of the delicious food I’ve eaten and the places I’ve visited. This was my first trip to France and I had a fantastic time with my oldest sister, Fiona. We stayed at the Hotel International on 6 rue Auguste Barbier. For anyone who’s interested I would recommend the hotel as it is close enough to walk into the centre of Paris but also has great access to the metro. The hotel was comfortable, cheap and clean with very polite staff. One major downfall of the hotel was that breakfast was not included with the room rates and so an additional €9 was required which we decided against. There was a McDonalds very close by which we visited every morning for our breakfast of petit pains or pain au chocolat and coffee. Please don’t judge us too harshly for this, as it turned out to be a fraction of the cost the hotel were expecting us to pay and if you’ve ever seen a French McDonalds you’ll know that it is VERY different from the ones here in the UK. They have little cafe’s in them called McCafe’s which sell baked goods like cookies, croissants, macaroons and brownies. It was at the McCafe that we ate every morning and indulged on buttered mini bread batons and espressos. I brought a pot of jam home for my mum to use, it was given to me with my petit pains and so I stashed it as proof that there are such things as Fancy McDonalds in the world. 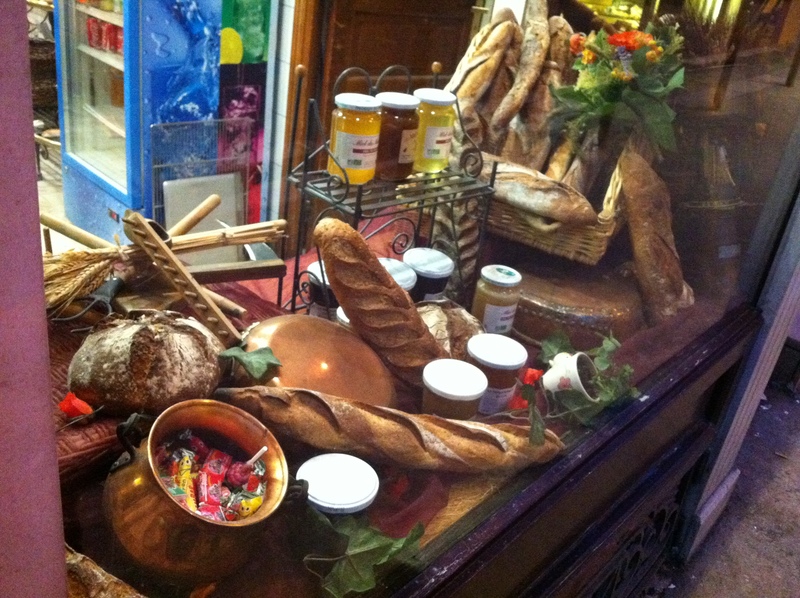 As you can imagine there was a Patisserie, Boulangerie and Boucherie everywhere you turned on the streets of Paris. Each looked as delicious as the next and with it being so close to Easter many had chocolate and nougat eggs, chickens and rabbits displayed on their counter tops. Worry that these would be crushed in my luggage stopped me from clearing the displays in a bad case of gift greed. 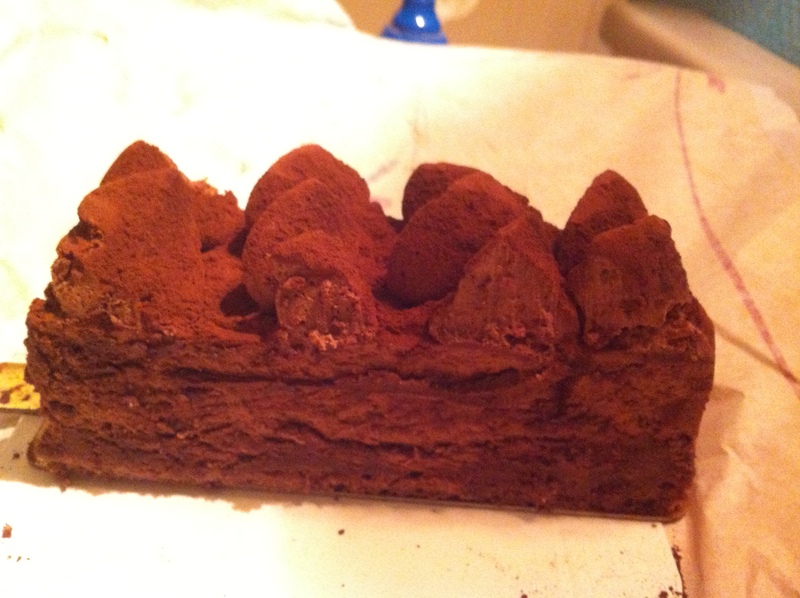 The Royal Choclat was so tasty, rich and smooth. It was such a treat at the end of a day full of walking around the Louvre and Notre Dame. 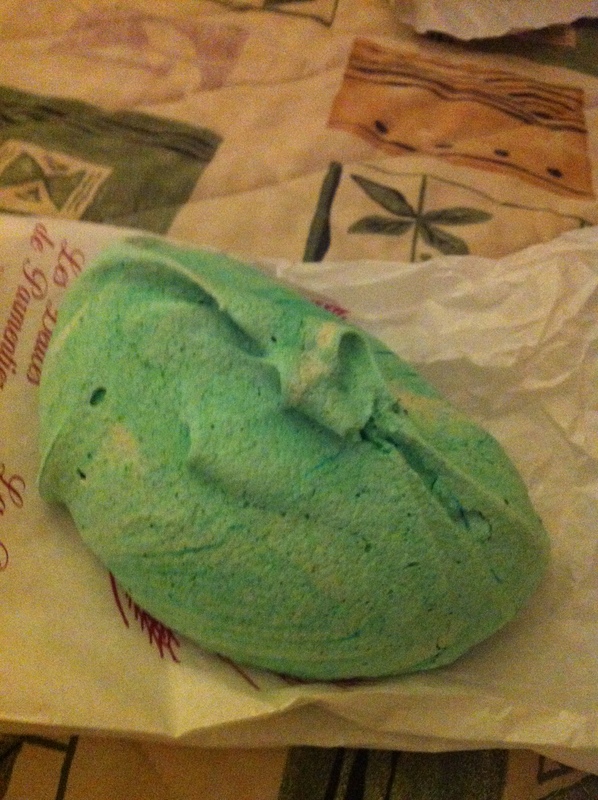 It was very indulgent so I did feel a little sickly afterwards but that’s probably down to my own greediness. My sister had nothing but great things to say about her meringue, personally they don’t float my boat so I didn’t try it. On the last day of our visit, we went back to this patisserie to buy some presents and I let myself have one last moment of weakness. I can’t remember the name unfortunately and it was such a last minute buy that I forgot to write the name down. Some of you may recognise it and know the name from the picture and description. 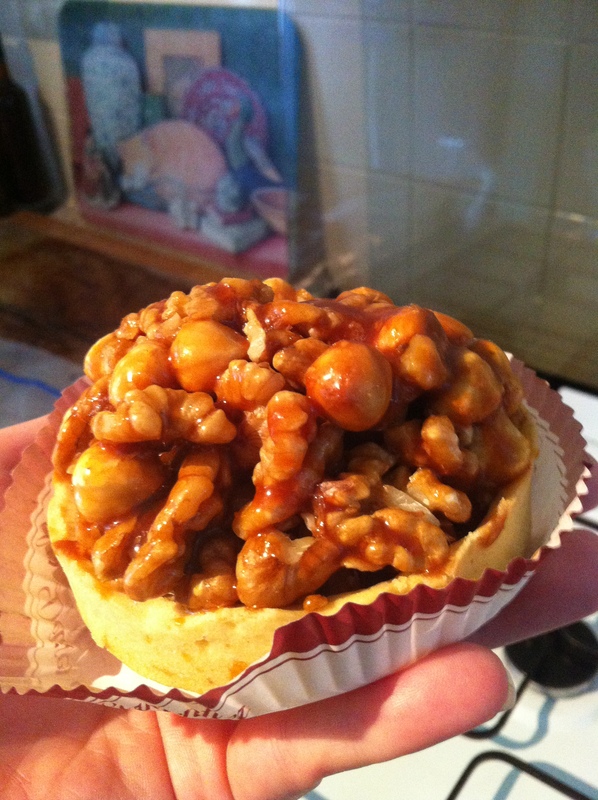 So, it was a mountain of walnuts and hazelnuts covered in caramel and sat in a sweet crust pastry dish. I know it had ‘noix’ in the title but alas that is all I can recall. It was lovely though! The pastry was cooked really well but the filling wasn’t the easiest thing to bite into. It was a perfect piece of Paris I stashed away on the Eurostar ready for me to eat with a cup of tea (avec au lait!) when I got back home to Blighty. 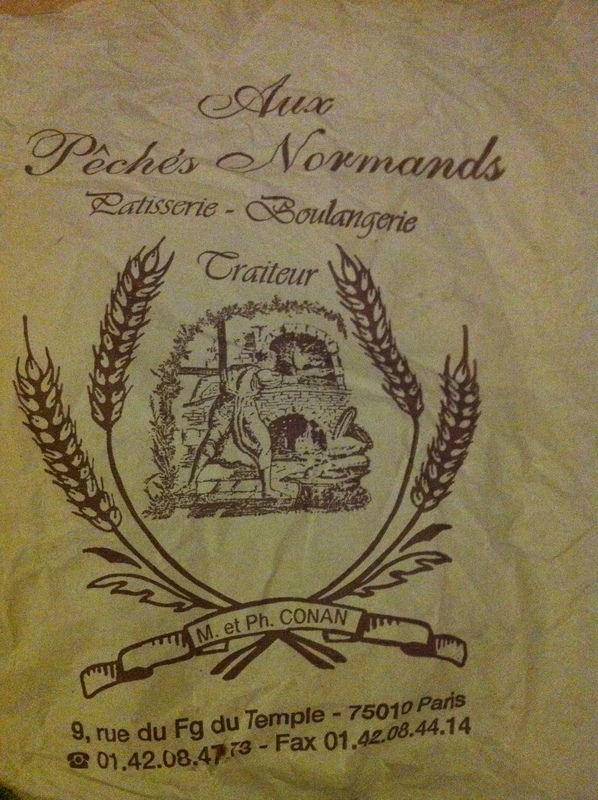 We also visited another Patisserie and boulangerie which was called Aux Peches Normands, you can find the details on the packet below…Here we bought Broccoli and Camembert quiche. It was so tasty I almost forgot to take a picture! So sorry that the quiche is half eaten but at least you can see the filling a little better 😉 The top may look burnt but it honestly didn’t taste it. 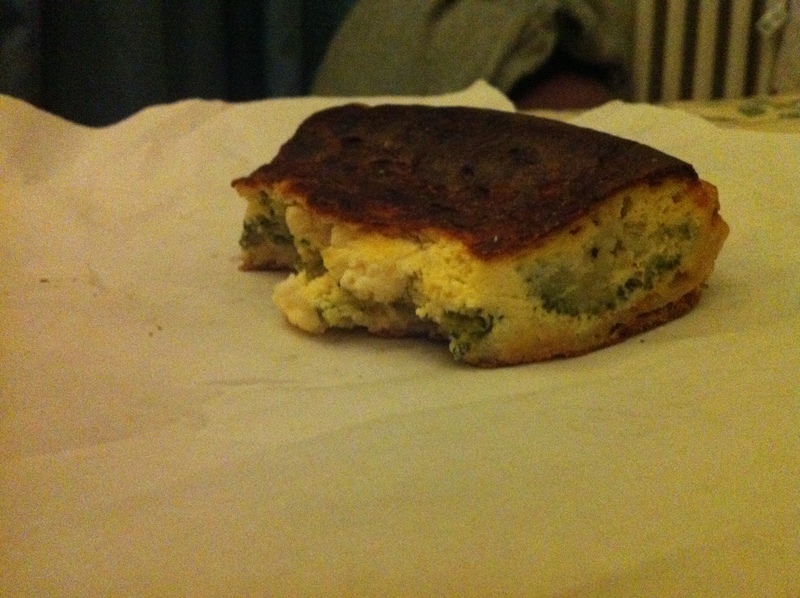 The texture was much drier than the filling but it didn’t affect the flavour of the quiche at all. The portion was very generous and the staff were very nice, especially when what little French I know failed me. 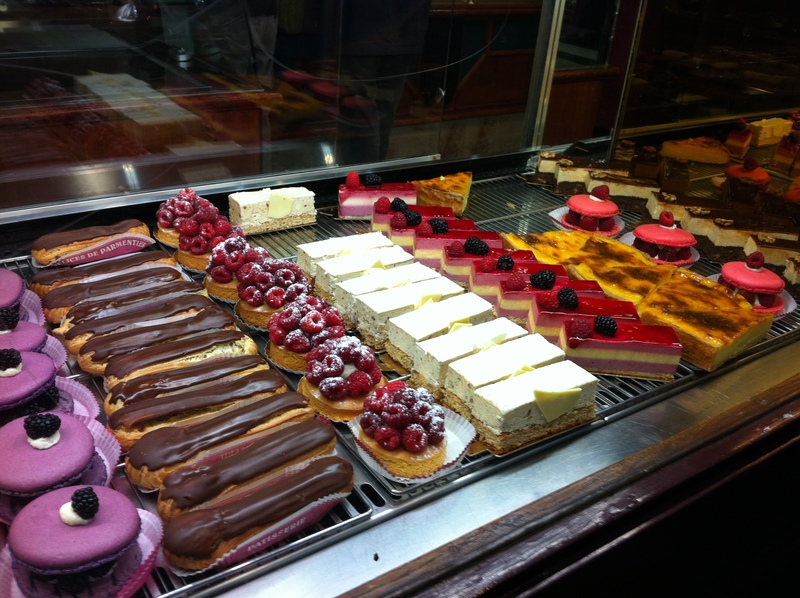 So if you’re planning a visit to Paris anytime then I would highly recommend these patisseries and boulangeries. Another place I can recommend is the Les Fondus de la Raclette. It’s a restaurant on the Avenue Parmentier just across from the patisserie I have already talked about. 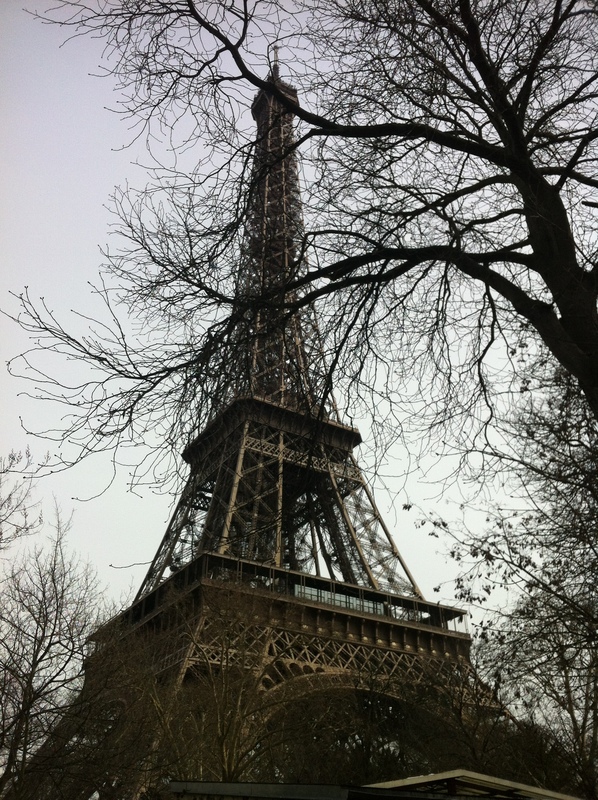 We liked it so much we visited it twice in the 4 days we spent in Paris. Both times I had the chicken burger which doesn’t sound very exciting but it had Parma ham on it and cheddar and was the most delicious burger I’ve ever had and probably ever will have. I don’t even like ham but I absolutely loved it on this burger. I also really enjoyed the cider my sister was given, it was called Valderance and again, I’m not a cider drinker but I really enjoyed this one. I don’t know whether I was being such a polite English girl in a country famed for its stubbornness, or if the ingredients and quality of food were that much better that I enjoyed food I haven’t enjoyed in years. The staff at Les Fondus de la Raclette were very welcoming and could speak English and French very well. It was an easy going vibe where groups of friends were able to meet and catch up and enjoy a great meal in such a cosy atmosphere. Although the restaurant did get quite busy as the night grew late and this did mean that we had to wait an inappropriate amount of time for our bill because the staff were so busy, this only further proved the popularity of the restaurant. There were many different people who visited the restaurant, including English, American, German and French. We overheard a German girl telling the waiter she had the restaurant recommended to her which only impressed us even more. This restaurant and its staff were delightful and I wish them every success and hope that they stay open for people to enjoy for years to come! 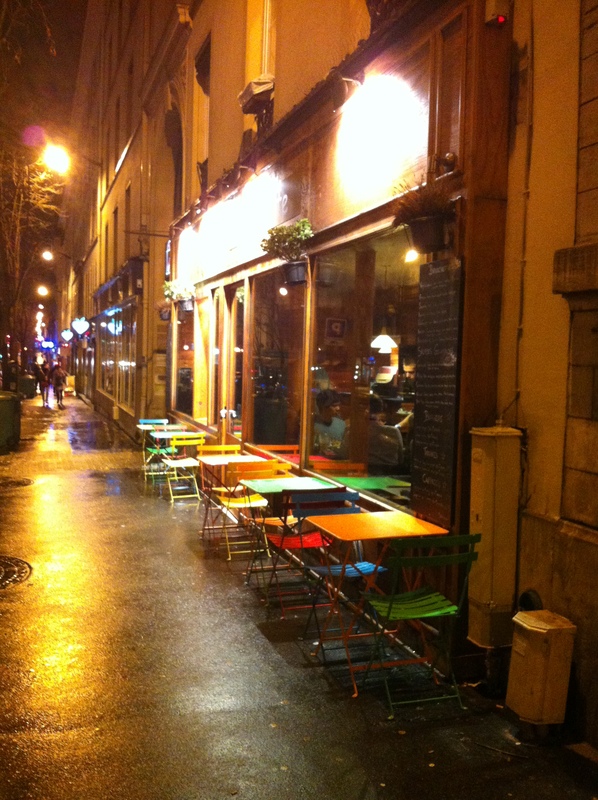 Here is the website and please go visit when you’re in Paris, keep your eyes peeled for the multi coloured chairs! Here’s one final image to wet your appetite because you can’t go to France and not eat a baguette! For years I thought that I didn’t like Pancakes *insert gasp here* this was because my mum would only make them with plain flour on Pancake Day. 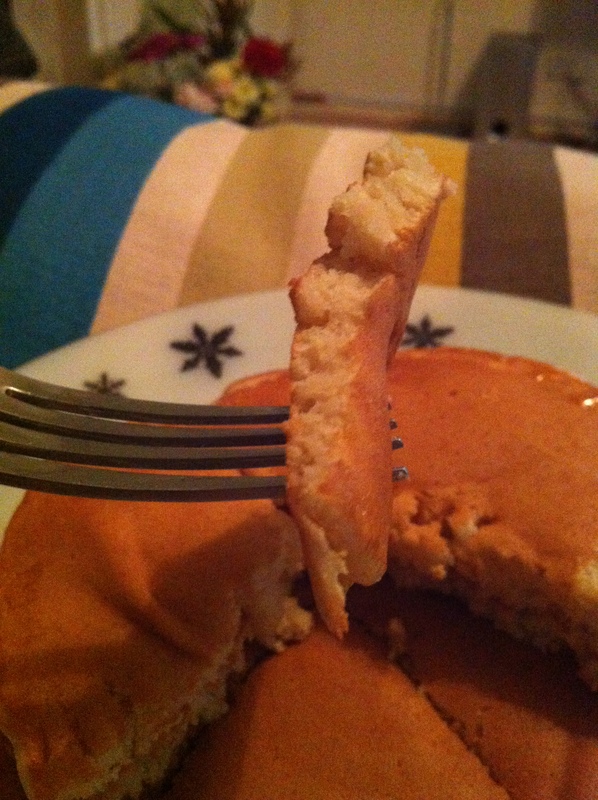 After trying the small packet pancakes you put in the toaster, I realised that I did in fact love them! 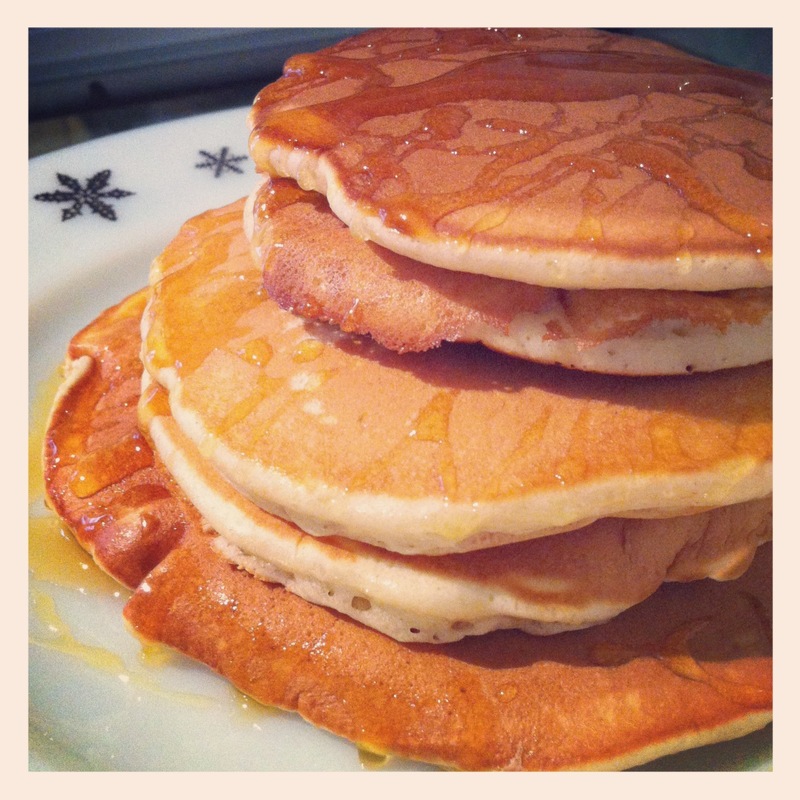 Growing up we never had them any other time than on Pancake Day, which I really cannot comprehend now. After using recipes I found online, I could never find one that I liked enough to settle with. The quantity was always too great and I wasn’t going to throw half of my batter away every time I made them. So I made my own recipe! The only thing with pancake recipes is that they use so few eggs, so when you get down to making a batch with just one you’re still going to have quite a bit of batter. You can cook all of the batter in separate pancakes and freeze them to toast for a quick breakfast another day if you don’t want to eat them all in one sitting. You could also pop the batter in the fridge for the next day if you didn’t want to cook them beforehand. Firstly, you add the flour, sugar and baking powder together in a large jug or bowl. I prefer to use a large jug as it makes pouring the batter in to the frying pan easier. Beat the large egg into the flour mixture. Do not pour all the milk in at once. Add about 50ml at a time, stirring the mixture with a wooden spoon after you do this. By gradually stirring in the milk you can keep an eye on your batter consistency to make sure it’s not too thick or too sloppy and thin. You may find that you would like to add a little extra milk; you can do this if you want to make it go a little further. I wouldn’t recommend going over 250ml though as the mixture will be too diluted and the pancakes won’t be all fluffy and thick. To make a smooth batter, with no flour or egg lumps use an electric whisk for about 5-10 seconds on the lowest speed. 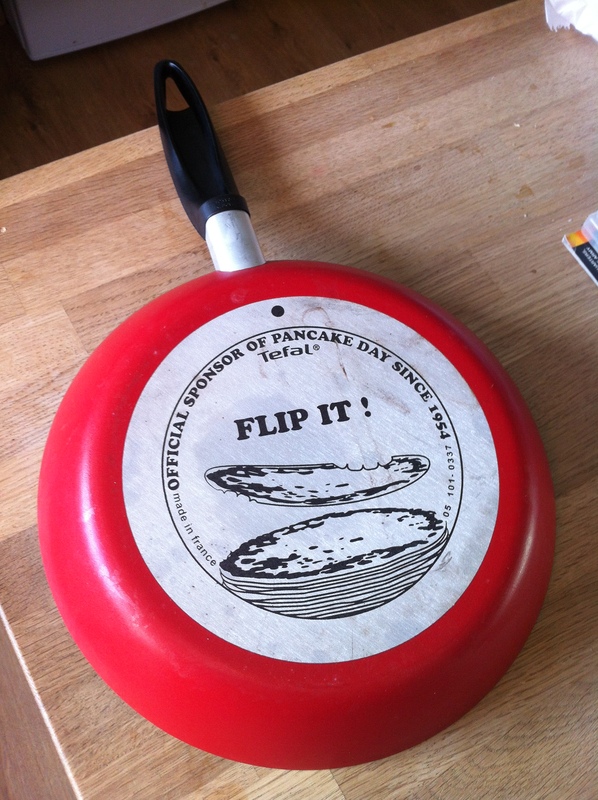 I recently purchased a new Tefal frying pan which was on offer at £7.99 in the shop Boyes for the Pancake holiday. To cook pancakes, tip about 1tsp of sunflower oil into the frying pan and using a pastry brush, spread the oil all around the pan. 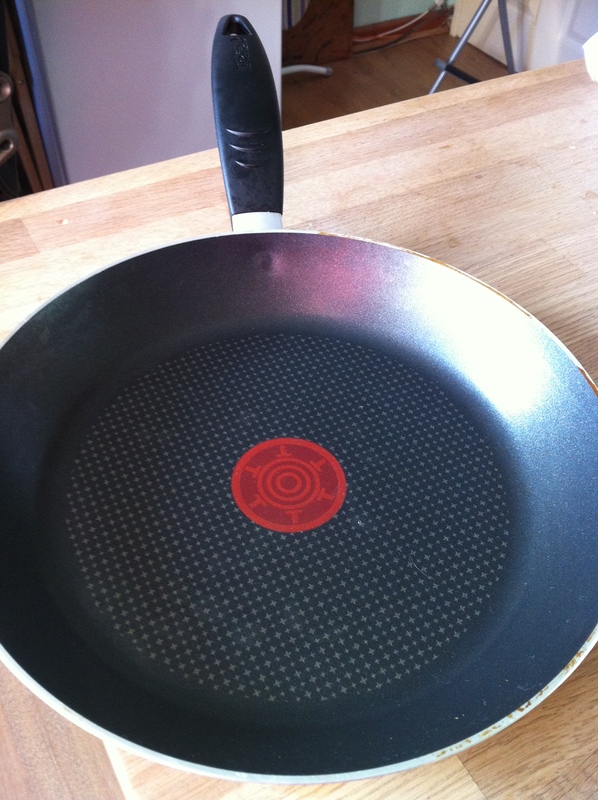 Turn on the cooker to a medium heat for about 30 seconds until the red spot on your Tefal pan has become solid red or for those who have a normal frying pan just until some of the oil has fried off so there aren’t any oil droplets in the pan that may give your pancakes a greasy texture. 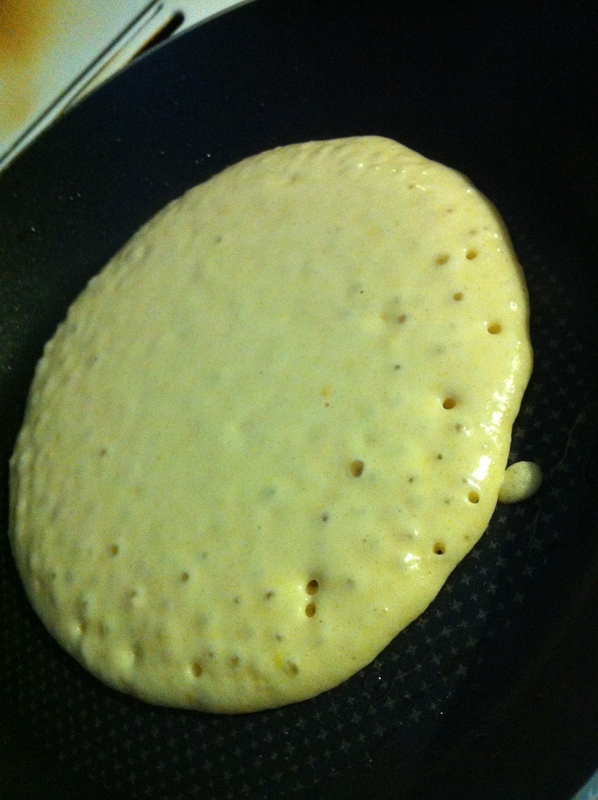 The other side will only need around 10 seconds to cook through and you should be able to see the pancake rise the second it hits the hot frying pan. I like to cook the pancakes one by one as it means I can focus properly on each and ensure I don’t burn any as even though the heat is low, they cook fast. 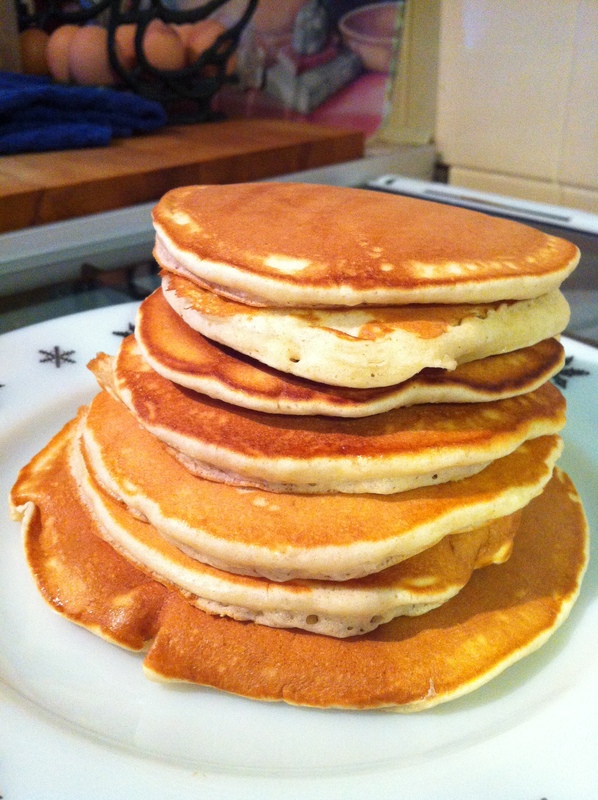 To serve, pile the pancakes up in a stack and apply the topping of your choice. I like to put golden syrup or butter on mine but for a healthier start to your morning honey and fruit is a delicious alternative. For a Canadian twist add some streaky bacon to the top and lather with maple syrup. 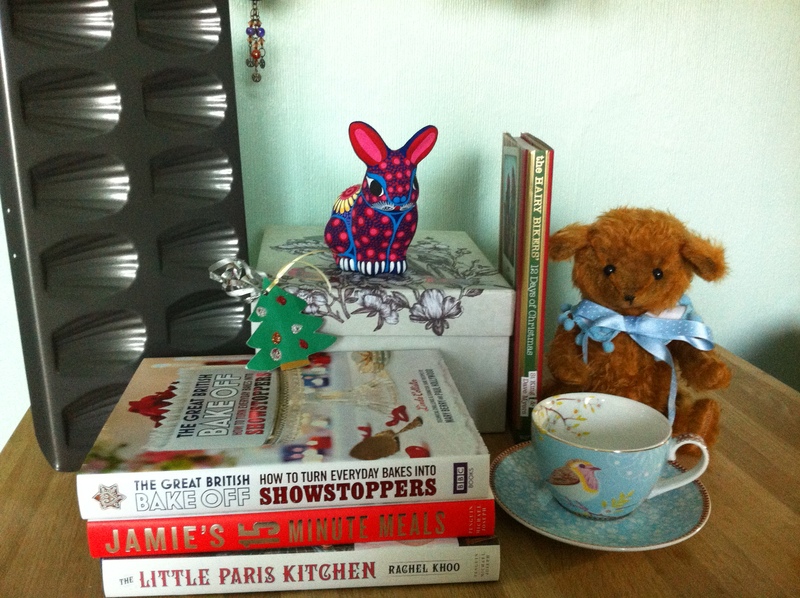 This picture shows 4 books which I received from family as birthday and Christmas presents and I want to tell you about why I got them and what I think about them. 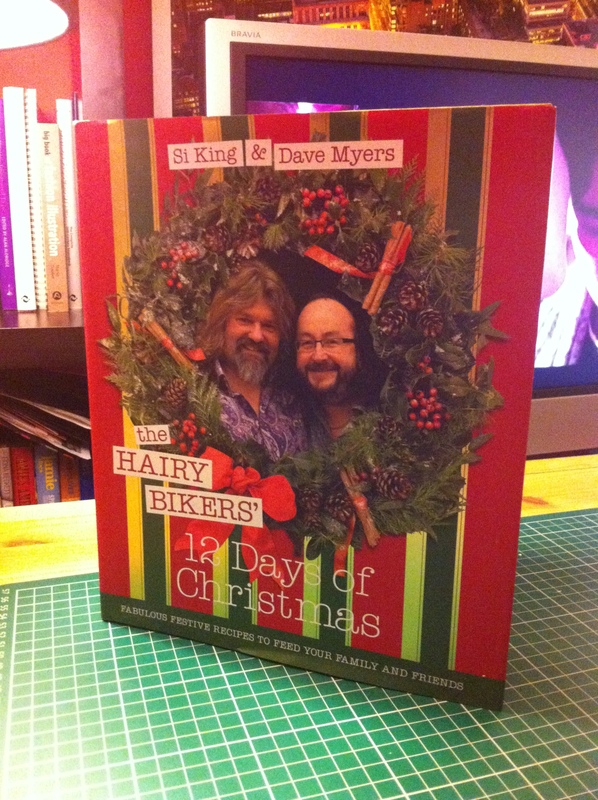 I received the Hairy Bikers 12 Days of Christmas cook book on my birthday just in time for Christmas dinner preparation and the other three were Christmas presents. I’ll run through my impressions of each book and any recipes I’ve tried so far. I hope you enjoy my little reviews and even invest in these titles in the future as each will be an asset to your kitchen bookshelf. I mentioned this book in my previous Christmas blog (part 2) as I used it to make my very first yule log and stuffing as part of my Christmas dinner. This is a great book for delicious and traditional recipes to impress and stuff your family’s bellies with over the festive period. Not only do the hairy bikers offer you recipes for the turkey and all the trimmings but they provide you with plenty of variations in flavours and textures you can pick from for a perfectly catered home meal for your family. For instance instead of providing a standard sage and pork stuffing there are recipes for Apricot and almond stuffing as well as many different types of mash, making this a fantastic book for a really personalised yet traditional Christmas dinner. Another great part of this book is the layout. When I said that it provides recipes for the whole festive period I meant it! Not only does this book supply the cook with bounteous amounts of Boxing Day, Christmas Eve and Christmas day treats it also has sections for New Year’s Day, the Twelfth Night, Edible Gifts, Cheese Boards, Telly Snacks and Christmas Baking! It’s such a well organised and generous book and with so many variations no Christmas will be alike, as you can mix and match for years to come. Overall I’m very happy with this book and its traditional but luxury Christmas food is fit for any family dinner table. The Hairy Bikers really catch that spiced Christmas feeling in this one and I’m certain it will be a regular in my kitchen at the holiday season. It has really helped me to establish those basic skills I can continue to improve the more I use these recipes. Rachel’s mission is to create delicious French food in her own unique way, a way which makes French cooking easy for the viewers to replicate in their own homes. Rachel runs her own restaurant in her own tiny apartment in Paris and creates all of her dishes for her TV show and restaurant from her minute kitchen. It is amazing how wonderful her dishes turn out when the space she has to work in is so small. Although her kitchen may be small in dimensions it is bursting with character and reflects the organised and clearly talented cook that is Khoo. Her cookbook is equally stylish and inspirational and with clear instruction and helpful pictures of the dishes this book is an asset to anyone’s collection. Rachel preaches the manifesto of the locally sourced products and the importance of a good food market, as well as displaying friendly relationships with her suppliers and an excitement for food that is remarkably catching. Not only are her dishes visually stunning but Khoo’s personality and clear passion for her craft is an absolute delight to watch. The recipes which stand out the most to me are 3 creamy dishes, the first is the Gratin Dauphinois on page 34 under the ‘Everyday Cooking’ section, the second is the Poulet aux Champignons avec une Sauce au Vin Blanc on page 187 in the ‘Dinner with Friends and Family’ section and the final recipe is the Mousse aux éclats de chocolat on page 222 under the ‘Sweet Treats’ section. I’ve tried a dauphinois recipe before that didn’t go to plan but I am keen to try it again as the combination of potatoes, garlic, cream and cheese is one I won’t pass up! The chocolate mousse looks so rich and luxurious that I almost wish I could pull it out of the page. On the other hand it’s probably best that I can’t. 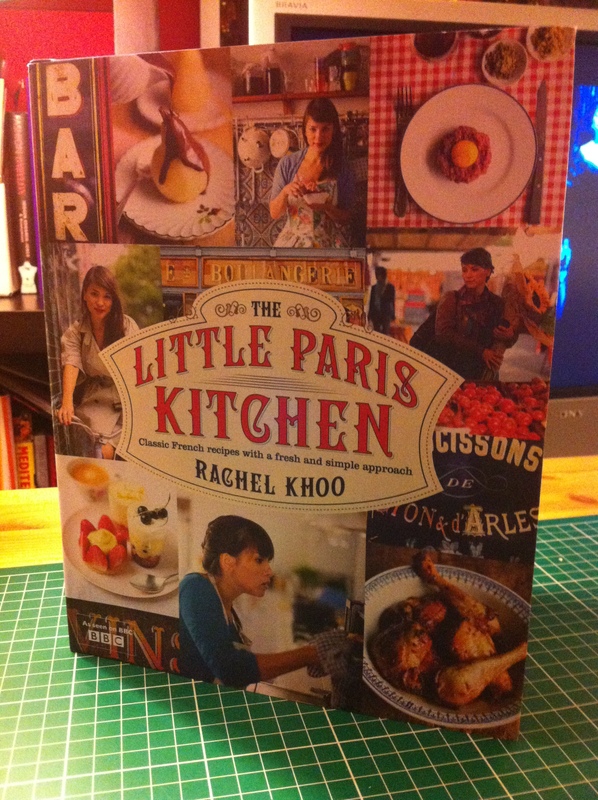 Each recipe has a French and English title, details on serving, prep time, cooking time, ingredients as well as a brief reflection of the dish from Rachel. The illustrations on the front and back covers are of food with their French names which as a design are pretty as well as being very informative for anybody who wants to kick-start their education in French cooking. Be careful though because after you take a look at all of Rachel’s fantastic pictures you’ll find yourself with a Eurostar ticket in one hand and a beret in the other! I am looking forward to creating these dishes and more from the book I haven’t mentioned, even more so since I will be visiting Paris in a couple of weeks so I can experience the infamous French cuisine myself. I am a big fan of Jamie Oliver and I support his views on healthy, good food for everyone be it children or professional adults with their hectic work lives. I believe that there is always time to cook and I think his energetic and enthusiastic character on screen is infectious and inspirational. 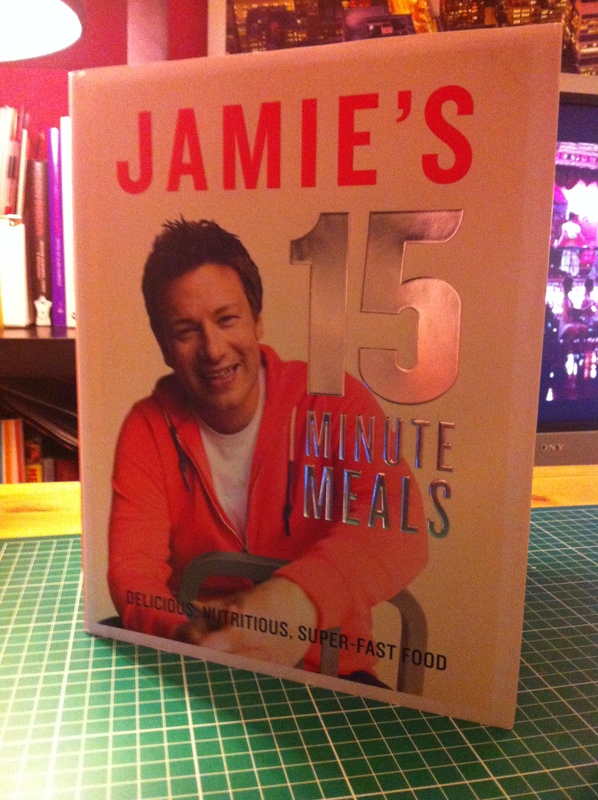 BUT… as much as it pains me to say this, on paper Jamie Oliver is something quite different. Recently I followed one of his recipes from this book for a family meal and I have to say it was much more stressful that I have ever encountered and I allowed myself much more time than 15 minutes! I used the recipe for Golden Chicken with Braised Greens and Potato Gratin and after my experience I’ve come to the conclusion that these are recipes only Jamie Oliver can do in 15 minutes. Although I appreciate his attempt to show people how easy and most importantly fast it can be to make lovely healthy meals for you and your loved ones, I feel the 15 minute promise is too farfetched and has resulted in a cookbook lacking in direction and explanation for those who wanted to create the meals regardless of the time frame. I found myself confused and frustrated with the short, sharp directions and often read them with disbelief. The lack of detail left me unsettled rather than feeling everything was straightforward and happening quickly. Similar to The Little Paris Kitchen, I tried the potato gratin and was left shocked by the lack of cooking Jamie expected for this dish. The onions are basically left raw and the frozen peas which you are directed to cook with the leeks and spinach leaves in a saucepan, are meant to cook from frozen in the time the spinach leaves wilt. It seems like such a shame especially as there are so many fantastic looking meals in this book and Jamie makes it look so effortless on his accompanying TV series. However, after trying this recipe I have been left feeling deflated and reluctant to try another on a whim. I would have to sit down with the book and make my own plan rather than struggling along with what little description is given. I am very sorry to Jamie as I love his work and this by no means should put you off buying the book for the dishes, just have a good read of the directions first and work your own time frame out. I’m sure with practise I will get faster at making them and I will continue to use this cookbook for future meals. What a gorgeous book! That’s pretty much it for this review…..
A visually stunning cookbook that makes you want to bake everything inside even if it contains ingredients you don’t like. Everything just looks THAT yummy. I’ve picked 3 recipes out to talk about as they jumped out of the page at me, they are that visually appealing. The layout is classical and well presented with pages giving tips on decoration throughout. The sections are again the usual ‘cakes’, ‘pies, ‘tarts’ etc. Each recipe has plenty of information about the bakes as well as numbered step by step directions on how to re-create your chosen bake just like the pictures provided. 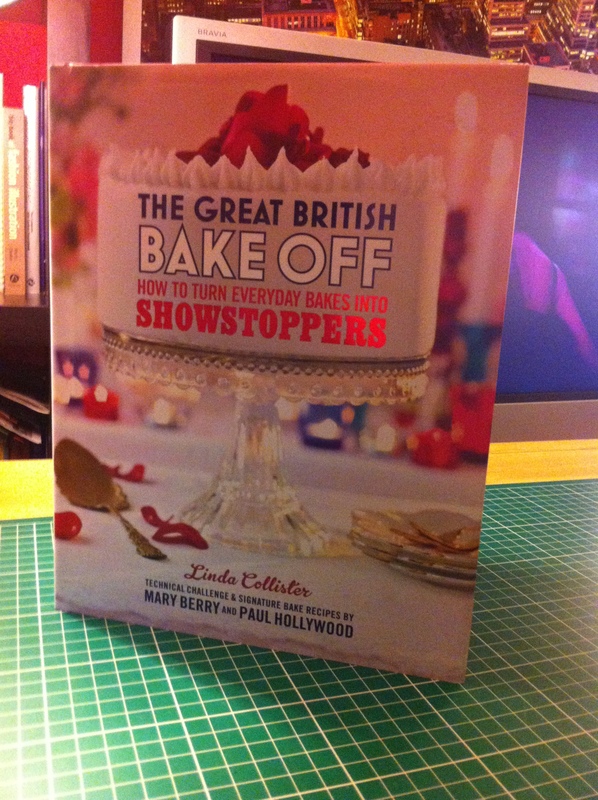 A great aspect of the book which links it to the Great British Bake Off show is the contestants novelty cakes and the recipes from the show that stood out. Such novelty cakes as the ‘Sixpence Cake’ based on the nursery rhyme ‘Sing a song of Sixpence’ Where 24 blackbirds are baked into a pie and one pecks off the maid’s nose. This cake is made to look like a pie with 3 blackbirds beaks poking through and when the cake is cut another beak can be seen holding onto a nose in the sponge. I was very glad to see that this had been included as well as the union jack novelty cake from the show. It’s really surprising how short and simple the ingredients lists are as well! This book will not disappoint. The first recipe I loved is the Pecan Pie recipe on page 214 under the ‘Pies’ section which has been cleverly decorated using a doily! The pie itself is a delicious American desert which is incredibly sweet and sticky. When I’ve made a Pecan Pie in the past it has been so full of sugar from the golden syrup that you feel the sugar running riot in your blood. The massive sugar rush is the reason why I would not recommend you make it a lot. It’s better as a one off treat for a special occasion. The pecans are best left whole as the large crunch you get from them work really well with the sticky sauce that is maple and golden syrup melted together along with butter and muscovado sugar. The icing sugar and doily stencil pattern on the top makes this pie a great feature for a dinner table or a tea party. This is one decoration tip I’ll be tucking behind my ear for the future! The second showstopper I want to share is the Jewel Box Cake on page 44 in the ‘Cakes’ section. This Cake is ridiculously elegant. It is a white chocolate sponge covered in raspberries with a white chocolate ribbon hugging the cake to finish off a seamless design. It’s simple yet flawless and would make a great wedding or birthday cake with the raspberries adding a touch of glamour as they sit on the cake like rubies. The third and final bake which caught my eye is the Hazelnut and Pear Dacquoise on page 254 in the ‘Desserts’ section. It’s no secret that I love hazelnuts as I made them a key ingredient in my Christmas dessert, and I am loving the way they’ve been accompanied with gold leaf to decorate this rich tasting and very rich looking dessert. You can tell from the decoration that this bake is indulgent and I think it would be very impressive if served to guests at a dinner party. This is not one of the simplest recipes in the book but it is worth the bake for a special occasion. Your extra time and patience will pay off in taste, compliments from guests and a pride from the knowledge that you have created such a posh pud! Thanks for reading guys, I hope you go out and buy these cookbooks if you don’t already own them! 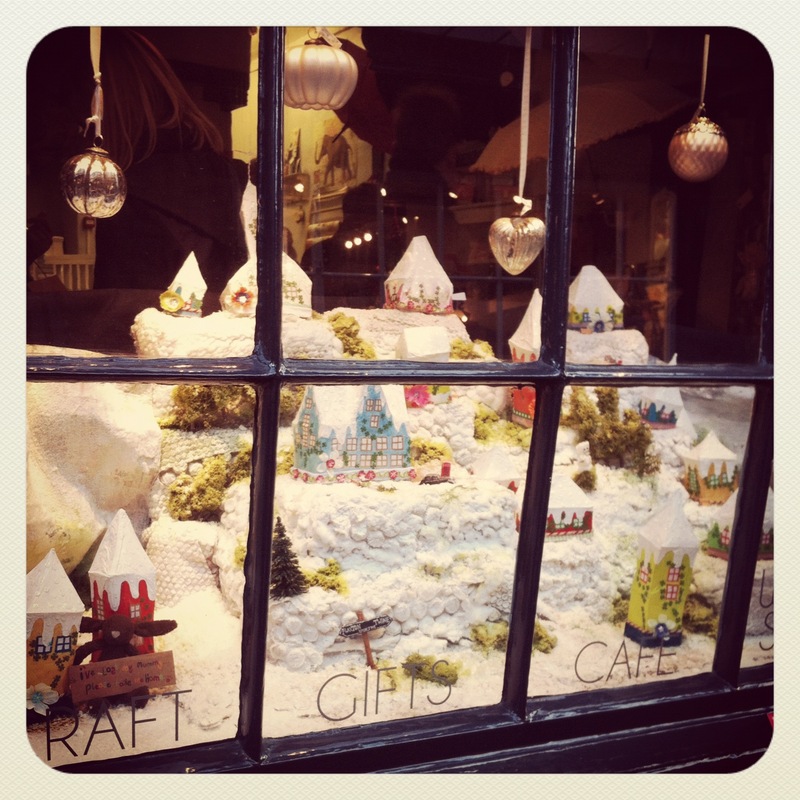 This is the last of my Christmas blogs for 2012 and I’m happy to have shared it with you all. This is just a little blog about a baking competition I was shown. I thought I’d share it for anyone reading who might want to enter! It’s a Cath Kidston one where they want you to make a novelty cake and send it in for a chance to win some fabulous goodies. Yesterday I spent the whole day crafting! My sister and I spent the day making some collages since I mentioned in my last post that I felt the urge to go back to ‘handmade art’. 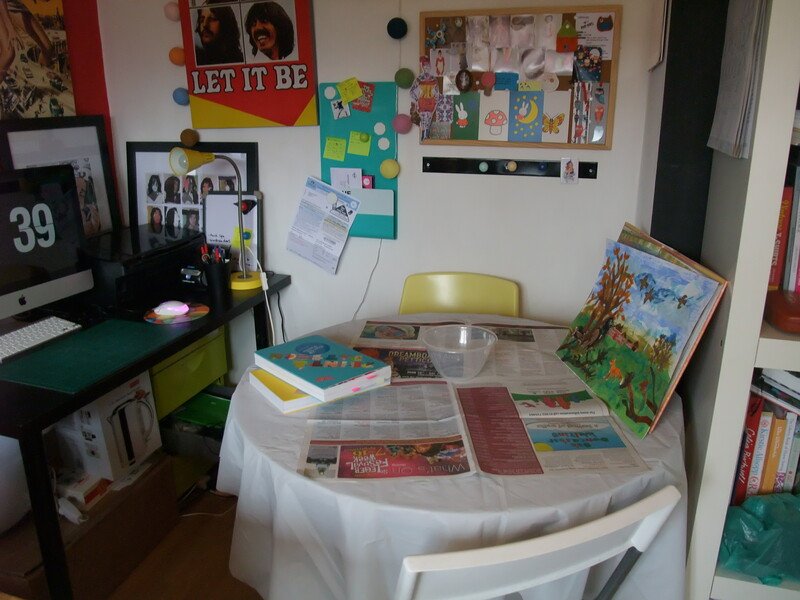 I was up bright and early transferring my room into a lovely little workshop environment ready to create some Mark Hearld inspired prints. My sister had never experimented with the technique of collage before therefore she was hesitant as to where to begin. Unlike me my sister is a writer rather than an artist. I am the sister who likes to draw and she is the sister who likes to write. It may not have been a white Christmas but the weather is making up for it now! Firstly, fry off the mushrooms and onions in 1 tbsp. of vegetable oil for 5 mins. Whilst they are frying blitz the slices of bread in a blender until you’ve made breadcrumbs and chop the chestnuts up roughly. Put the breadcrumbs, Chestnuts, Mushrooms and Onions into a bowl all together and before combining add the sage and Salt & pepper. Mix all of the ingredients together in the bowl and add more seasoning if you wish. Finally, put the stuffing into an oveproof dish well-greased with butter. The oven should be on gas mark 5 and it will need about 30-40 mins. If you are worried about the ingredients not binding, or if you want to shape them into balls then you can add 1 egg to the mixture before shaping. Unfortunately I do not have a picture of the stuffing as it was dished out straight away and in all honestly it’s not the prettiest of dishes so a picture wouldn’t have done the taste justice. My first attempt did not go to plan, as I ended up leaving the sponge in the oven for too long and overdoing it which meant it wouldn’t roll. This however was not such a big deal as I made my Yule Log on Christmas eve to take any pressure off and had plenty of ingredients available to me just in case. 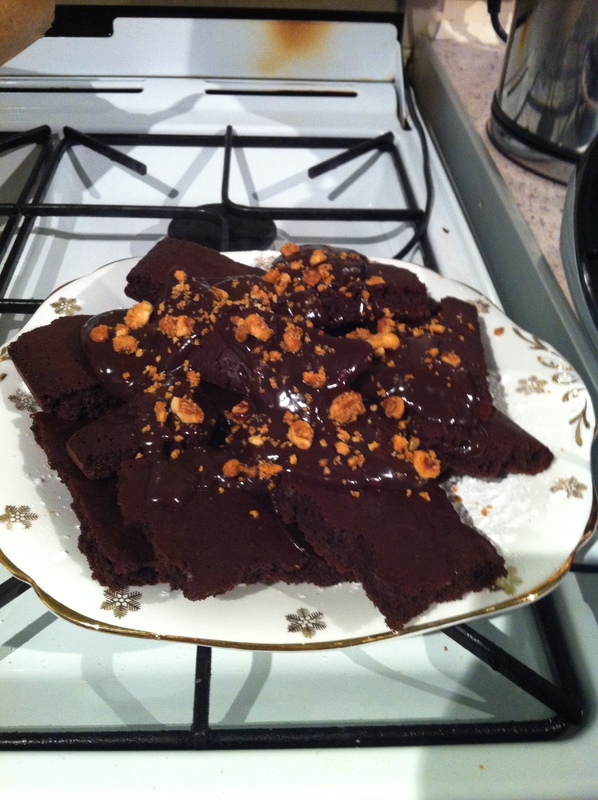 I didn’t want to waste the overdone sponge as it wasn’t burnt and so I broke it into pieces, poured over some excess ganache and topped with some hazelnuts which I had roasted and bashed up in a pestel and mortar, ready to use on Christmas day. This is a picture of the overdone sponge which was given a new lease of life as a Christmas Eve treat and very well received despite the hiccup. This can be purposefully made as a rich chcolate pudding as it is indulgent yet can be further improved with a splash of Amaretto. Perfect for a dinner party. I think this is a beginning of new Christmas traditions for me and I think these dishes will be a staple part of my Christmas feasts year after year. 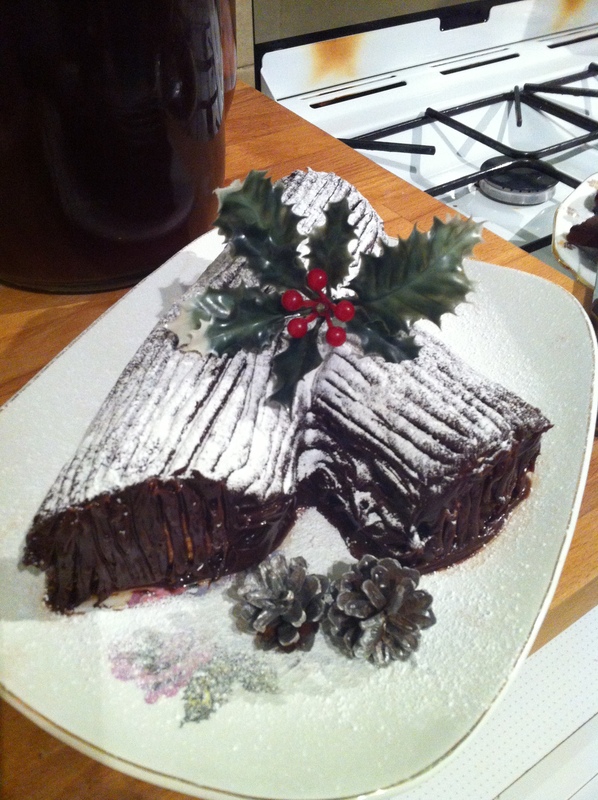 As a first bake my Yule log came out very well, in this case preparation was the key and the allowance of time took any worry and pressure away. The stuffing is a versatile recipe and I will be experimenting with different ingredients for all different occasions, no doubt. Thank you for reading and I hope you all had a lovely Christmas and especially a delicious Christmas Meal with your family and loved ones. 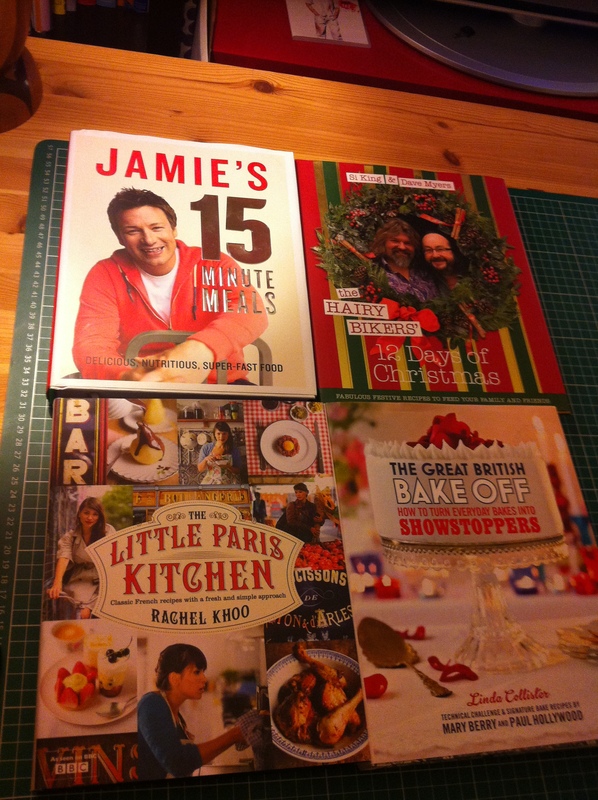 My final Christmas Blog will be all about the baking books I received as presents and my favourite recipes in them! Part 1. Handmade and Homemade Gifts. The Flax & Twine, Shambles, York. A handmade gift is one made with love and dedication, so whether it’s sewn, baked or built take the time to appreciate the effort it took to craft such a gift especially for you! As much as I love Christmas and buying people gifts I admit to being a last minute worrier. I worry about whether I’ve been fair and usually continue adding extra presents on my list until I’ve no money left! But Christmas 2012 saw my first controlled Christmas as I’ve come to realise that homemade gifts are a perfect way to top up a stocking without emptying my bank account. Not only are these completely personalised but can also be very cheap to make, if you find that your Christmas budget is a little tight. These presents don’t always have to be made by you as many people sell their hand-crafted goodies on Etsy at reasonable prices. 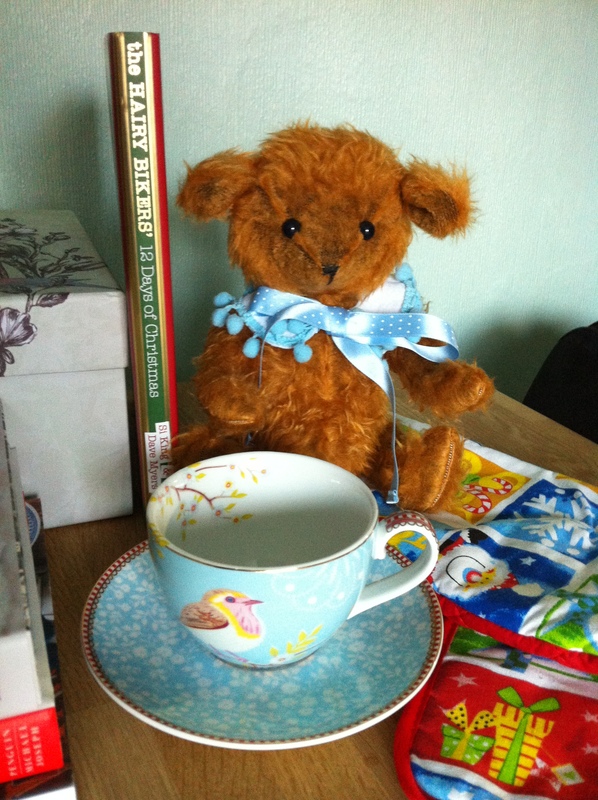 The picture above shows some of the gifts I was given which I want to share over these next couple of blogs. The colourful bunny you can see is absolutely gorgeous and an example of the amazing handmade gifts you can buy from Etsy. Given to me by my Sister, this rabbit ornament is hand painted from Mexico and the patterns and colours on its back are breath-taking! 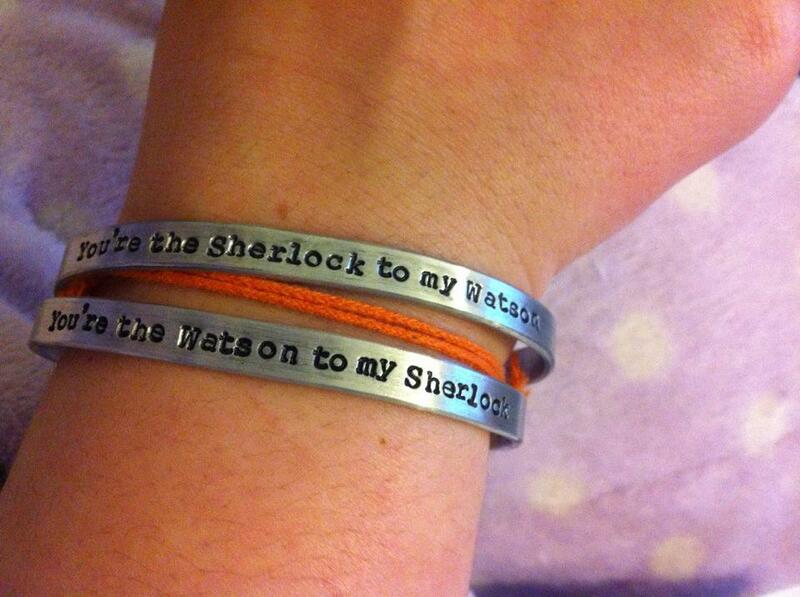 Here’s the link for you to take a better look and so you can begin your Etsy addiction! In the larger picture you can also spy my madeleine tray! I was so happy as I’ve been wanting to make madeleine’s for so long and now I can put my recipes to use. I have a recipe for Chocolate and Hazelnut Madeleines in my appropriately titled ‘Gifts from the Kitchen’ book. Not only will this tray be used to make Madeleines for me but means I can treat those I love to these delicious delicacies. Madeleines are perfect food gifts as their shape is so elegant and can be made to look even fancier with a sprinkling of icing sugar and placed in a cute box with ribbon tied around, making them a visual and edible delight for your recipient. You may be thinking that this must have been an easy handmade Christmas for me as I haven’t made any gifts myself! Well, Etsy may be a fantastic resource but I just couldn’t find a perfect Journal for my friend and fellow English Literature Graduate, Kim. So I decided that I would make one myself armed only with Kirstie Allsopp’s amazing DVD ‘Kirstie’s Handmade Christmas’. By watching her make a leather journal from scratch I taught myself the art of book binding and created a suede journal with ivory pages and blue trimmings. I already had a lot of the bits and bobs I needed including ribbon, sequins, beads, embroidery thread, lining paper and glue but the suede came from an old jacket of my mums which she had torn a little on the sleeve. Not wanting it to go to waste she gave me permission to go at it with a pair or fabric scissors leaving very little behind. I didn’t use all of the jacket on one journal and so I have pieces left over for more journals to be made into future gifts. The only bits I had to buy were ivory paper for inside and wax covered linen thread to sew the pages to their cover. I did however stitch, glue, cut and measure every last bit of the journal myself and I was very happy with the result. 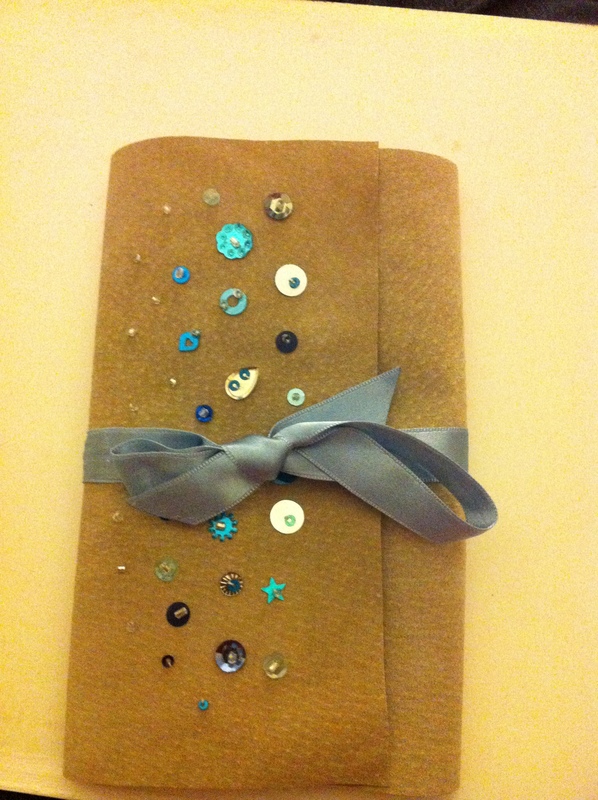 Here is a picture of the journal after I had finished the cover design. I lined the journal with blue paper which had a dainty white flower print, I later used a blue embroidery thread to secure and tidy up the overlapping suede around the edges instead of cutting off the material as Kirstie advises. To finish it off I wrote a personal message on the front page to complete my creation. I hope this Journal brings Kim just as much inspiration and creativity as I felt when making it. Not only did I create a gift for someone very dear to me but I learnt a skill that allows me to keep on giving bigger and better handmade and homemade presents to those I love! Thank you for reading and look out Next Thursday for Part 2 when I finally talk about my BAKING! since this was meant to be a baking blog 😛 I’ll be sharing my Yule Log recipe as well as my mushroom and chestnut stuffing recipe which I created especially for Christmas Day 2012. Me and ice cream, perfect marriage! Although I am a newbie to WordPress, I am not a newbie to blogging. I attempted it once before…over a year ago. With that train wreck behind me I’ve made the decision to switch to WordPress in an attempt to redeem my Blogger sins. I want to share my baking, baking book reviews, crafts and some vintage pieces I pick up along the way, and I want to share recipes, tips and cooking confessions with those who are willing to confess them as well! It’s no secret that the world’s in a baking frenzy at the minute and I adore it! The shops are churning out floral patterned everythings , endless new cake, jelly, and chocolate moulds and more baking books then I have floor space! I like this new obsession and I am very lucky to be surrounded by people who share my passion for food and like with many things, (especially chocolate) the more the merrier! I’m ready to re-join the Bloggers with my wooden spoon in one hand and the other tapping away at the keyboard…and possibly a whisk between my teeth and a recipe stuck to my elbow, but thats for another post. 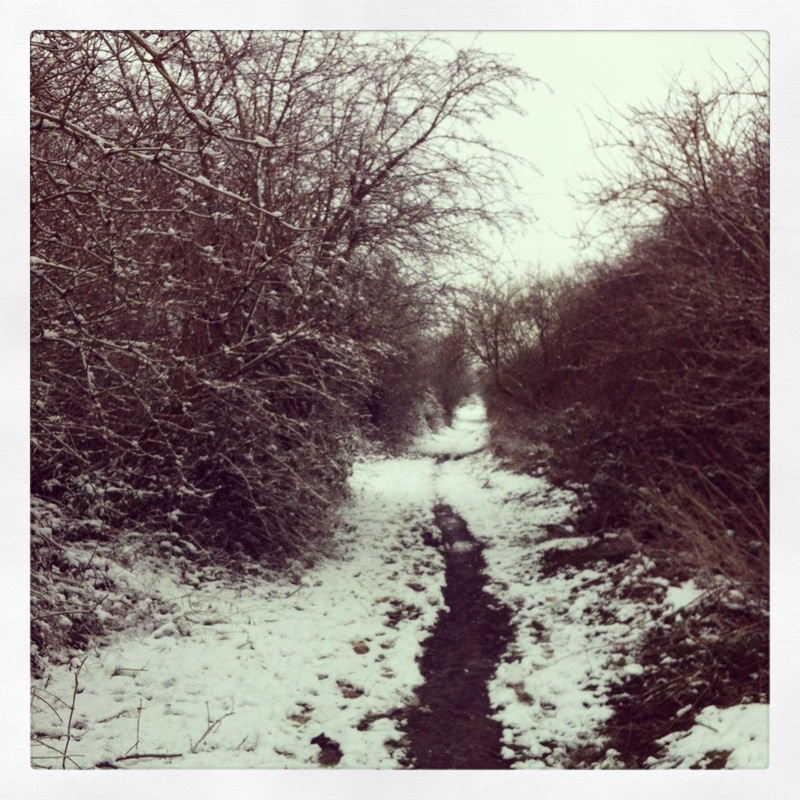 Keep checking in because I’ve got old posts to dust off and re-introduce to the world of Blaking (Baker Blogging, I’m trying it out!) and over a years worth of bakes, buys and makes that are just itching to join the WordPress ranks rather than just making my Instagram page look good. Thanks for reading! and feel free to follow on twitter or instagram!